In many countries around the world the environmental legislation and waste treatment is in initial stages or quickly develops further. The recycling of the organic portion in our wastes is obviously advantageous e.g. as humus for healthy soils, for the recycling of nutrients, as renewable energy, for climate protection and for low emission landfills. However, only in very few cases the type, volume and duration of organic waste streams can be foreseen in the long run. successful in more than 70 plants in more than 20 countries in all climatic zones in the world. Can we test all this? This is the outstanding advantage of the UTV composting technology: there is a mobile test version to lease that can be transported easily. How much time takes it to install the system? Within 6 to 12 weeks this technology can be built up in all parts of the world. Where are cost advantages to be seen? Quite simply, a membrane cover is more favourable and more flexible than concrete. The on-demand controlled and optimised aeration needs a minimum of power and energy which can be compared with a good hair blower. Can the membrane cover be compared with an enclosed plant? Our technology lies between an open windrow composting and the enclosed technology including the advantages of both systems. 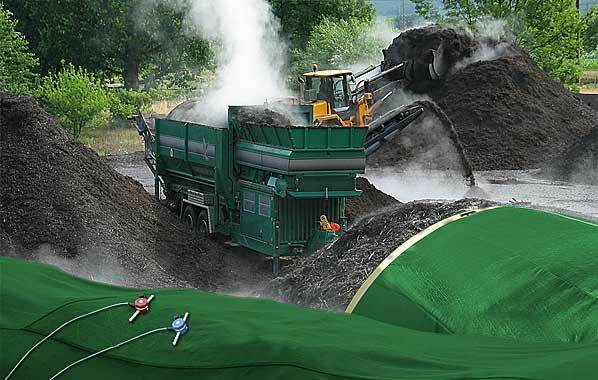 It is similar to the open heap composting, which means simple and flexible, however, it offers the same controlled conditions for decomposition by the membrane cover like a complex invessel plant. In some countries the system got a permission/licence as an enclosed plant. How does the membrane cover reduce emissions? A series of technical details of this composting system contribute to efficient reduction of emissions. The central point of the entire conception is the semipermeable membrane, the finest pores of which act as a barrier for big molecules like odorants or bio-aerosols. Furthermore the odorants condensate at the inside of the membrane fabric, drop back into the compost heap and are there decomposed by micro-organisms. Several studies underline the comparability of the reduction in bio-aerosols and odours compared with enclosed compost plants. Is the technology suitable for the treatment of residual waste and the drying of refuse? Wherever there is a question of transforming organic waste material effectively and without emissions in an enclosed system the UTV composting systems can be used. This means plants for biological drying of waste prior to a more efficient incineration as well. This applies additionally for a mechanical-biological treatment MBT, which in many countries serves to degrade the organics in mixed waste in a biological step by composting after mechanical segregation of the valuable materials and a high-calorific fraction. This stabilised final product of the decomposition process can be landfilled without any problems.